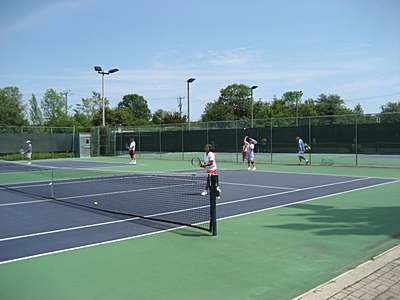 Don Mills House League is a great way to meet other members in a friendly, competitive setting. For more details about Club’s House League and find out how to register online please see our House League page. Kaffeeklatsch, an organized social doubles program, is a great way to work on your game and keep fit in a relaxed and friendly social atmosphere. No commitment required; just drop in and play for as long or as little as your time permits. All ages and skill levels welcome, however, not appropriate for beginners. Format: Doubles (eight game sets). The first deuce point is played normally with full ad scoring. If there is a second deuce, it is played sudden death (no ad scoring) and the receiving team chooses which player receives serve. Players mix up and rotate on an ongoing basis. Tennis balls and coffee provided. For more details please contact Chris Elliot , Kaffeeklatsch coordinator. Our popular socials feature organized social tennis, free coaching drills, raffle prizes, a delicious lunch and lots of fun. Rain or shine.